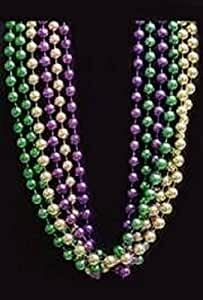 Mardi Gras, Purple, Green, and Gold Metallic Beads, 7 mm, 42″, 1 Dozen (12pcs). Mardi Gras, Purple, Green and Gold Beads, 7 mm, 42″, 1 Dozen (12pcs). 42in Purple, Green, and Gold Long Beads – traditional Mardi Gras throws. These are perfect throw beads for Mardi Gras and other parades – purple beads, green beads, gold beads. No color choices.